Open 7 DAYS A WEEK 363 DAYS A YEAR (Closed Thanksgiving and Christmas). We go rain, snow or shine so dress appropriately for the weather. How It Works for ATV’s and UTV’s. Don’t be late! We recommend parking in the DQ parking lot next to our store, the Public Library or the Estes Park Parking Garage. The Garage is located just behind the Estes Park Visiting Center on the East side of town (See Map Below). Allow yourself 10 minutes to walk to our store front, or park where you can find parking however give yourself time to get to our Shop. If you are late you might not be able to ride or get your full ride time. No refunds if you are late. PLEASE NOTE DURING THE SUMMER MONTHS PARKING IS HARD TO FIND SO ALOW EXTRA TIME TO FIND A SPOT. HOWEVER, DON’T WORRY ABOUT THE TIME PARKING BECAUSE YOU WILL BE DRIVING YOUR CAR TO THE TRAILHEAD. Fill out paper work. Please bring your Driver’s License, Credit Card, Debit card or cash for your deposit. With a credit card we just imprint with a credit card slip we don’t put a hold on your card. With a debit card we will put a hold of $500.00 with the imprint and refund it at the end of the ride. Cash we just hold the $500.00 and give it back to you at the end of the ride. We will do a safety meeting, provide a trail map and a map to the trail head to make sure you know where you are going. It’s that simple! You will drive your own car 20-30 minutes to the parking lot area where the ATV’s are unloaded, gassed and ready for you. We will do a safety meeting with you and once that is done you are on your adventure in the Colorado Rockies. When you are done with your ride just bring the ATV back to the staging and go home. Our prices include everything. NO hidden fees. How It Works for Jeeps, Cars, and Motorcycles. must be 25 years or older to rent. Must have credit card Drivers License OR a Motorcycle License and a copy of your Full Coverage Insurance card or a picture of it. Park at the Public Library or the Estes Park Parking Garage. 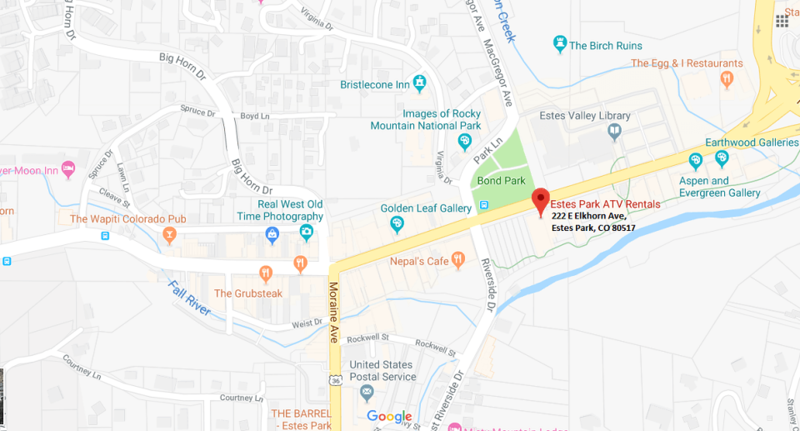 The Garage is located just behind the Estes Park Visiting Center on the East side of town (See Map Below). Allow yourself 10 minutes to walk to our store front, or park where you can find parking however give yourself time to get to our Shop. If you are late you might not be able to ride or get your full ride time. No refunds if you are late. PLEASE NOTE DURING THE SUMMER MONTHS PARKING IS HARD TO FIND SO ALOW EXTRA TIME TO FIND A SPOT. Fill out paper work. Please bring your Driver’s License, Copy of your Full Coverage Insurance, Credit Card, Debit card or cash for your deposit. With a Credit or Debit card we will put a hold of $500.00 with the imprint and refund it at the end of the ride. Cash we just hold the $500.00 and give it back to you at the end of the ride. We will do a safety meeting, provide trail maps and can give you suggestions where to go. It’s that simple! Then we will shuttle you to your Jeep, car or motorcycle. It’s only a 5-minute shuttle. When you are done with your ride just bring it back to the parking area where you started with a full tank of gas and we will shuttle you back to our store.